After a friend fails English, the plans that 13-year-old Jax and his friends had for a summer at Camp Runamuck go out the window. But miraculously, the teacher offers a chance to earn extra credit. The students must find several fake artifacts to include in a display on fairy tales at the local library. But finding junk isn't as easy as it sounds. And when the group discovers that the teacher has cut the same deal with more than 50 kids, it's a race to the finish line in an effort to save their summer vacation. When the search through junk uncovers the truth, that one of the artifacts they're searching for is real and can be used to rewrite the endings of fairy tales; things get real pretty quickly! 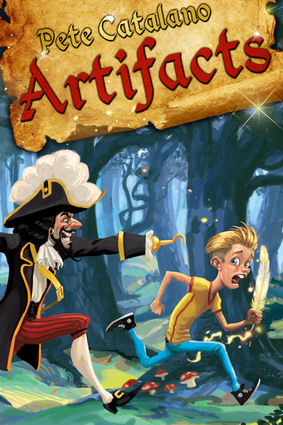 To secure the artifact, the friends will fight fairy tale villains and compete against heroes and classmates to see who can get their hand, hook, claw, or fin on it first. Pete Catalano writes books for kids of all ages as well as adults who secretly never grew up and he tries to keep the suspension of disbelief in his life as much as he can. He lives in Charlotte, North Carolina.